Textual analysis and criticism of religious texts was a real innovation in the mid-nineteenth century. 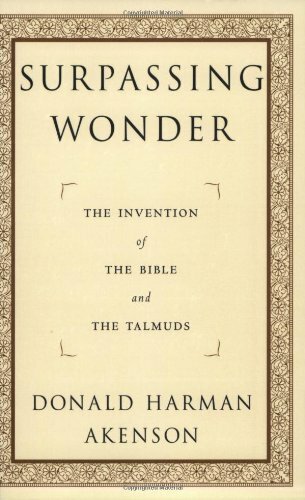 However, historical criticism of the Bible and the Talmud exhibits the amusing spectacle, as work has slowly progressed, of converging on something very much like the traditional account. Few areas of academic endeavor are so in need of public debunking as are biblical studies. The physicist Richard Feynman coined the term "Cargo Cult science" to refer to literary speculation that tries to steal the authority of the physical sciences by using some of their vocabulary and format. Much the same relationship holds between such enterprises as the Jesus Seminar and the methods of serious historians. In this book, Donald Akenson, a noted scholar of Celtic studies, uses his own discipline's perspectives on textual analysis to critique the modern treatment of the Old and New Testaments, as well as the less well-known evolution of the rabbinical literature that was created during the five centuries following the destruction of the Second Temple in AD 70. This is merely by the way, since the primary purpose of "Surpassing Wonder" is to set out Akenson's own theory of a "grammar of invention" that supposedly governed the evolution of all this vast body of material. The result is a book that is valuable for its general insights, and especially for its history of the tradition that led to the Babylonian Talmud. Still, though the author makes light of postmodern analytical methods, nevertheless "Surpassing Wonder" is willfully tendentious in a way that is characteristic of postmodernism. The author flips back and forth between the assertion that "all we have is a text" and appeals to questionable historical reconstructions, all the time drawing analogies from dated popular science. Akenson succeeds in clearing away some learned nonsense, but the effect is sometimes like that of a critique of "recovered memory" therapy made by an intelligent astrologer. "Surpassing Wonder" begins with a bold hypothesis. According to Akenson, the first nine books in the Bible (excluding Ruth and counting First and Second Samuel and First and Second Kings as one each) were composed as a unified whole. The work may even have had a single editor, who would have lived among the exiles in Babylon in the sixth century BC, after the destruction of the First Temple. The Genesis-Kings unity was based on material deriving from the Temple writings of the now-destroyed Kingdom of Judah, and of course the editor did not imagine that his compilation was in any way innovative. This, in fact, is the first rule of the "grammar of invention" that Akenson describes: novelty is never admitted. Still, the result was substantially new, if for no other reason than that it suppressed other traditions that existed before the Babylonian Exile. For one thing, Genesis-Kings established that the religion of the People of God would be a monotheism centered on Yahweh. (This point was not altogether clear in the strand of documents coming from the northern Kingdom of Israel, whose name for the divine was "elohim," a plural.) The work ensured that this religion would not be just a temple religion, but one centered on a single Temple and the ritual performed there. (This point, too, had not been clear, since Solomon's Temple at Jerusalem had never been able to entirely suppress all other centers of ritual sacrifice.) It established the notion of the various covenants with God, first with Noah, then with Abraham, then with Moses. It also established the notion of history as a theodicy governed by the results of breaking these covenants. Finally, it did all this by being very conservative of its sources. The Bible is filled with "doublets" of text that tell somewhat different stories about the same thing. Thus, famously, there are two creation stories in Genesis, and they are not obviously consistent. Consistent or not, all the narratives in Genesis-Kings routinely echo each other: covenant with covenant, punishment with punishment, prophet with prophet. The "grammar of invention" of which Akenson speaks consists of just these themes and these methods of presenting them, repeated and transformed throughout the thousand years after the completion of Genesis-Kings. Literatures grew up speaking this grammar, and so produced works that later could be incorporated into carefully constructed canons. While not wholly original, the notion that the Bible and its associated literatures are essentially a riff on a few basic measures has a lot to recommend it. As a method of historical investigation, however, it does have certain pitfalls. Akenson describes the religion of the ancient Davidic kingdom as "Yahwehism," and asserts that its beliefs and practices are simply unknowable. During the Babylonian Exile a new religion arose, "Judahism," that both composed the Genesis-Kings unity and was shaped by it. It was Judahism that returned to Palestine with the small band of enthusiasts who built a new Temple. Then another cloud of unknowing descends on the religious condition of the People of God until AD 70, when Judahism is succeeded by "Judaism" and Christianity. Here we see the problem: this hypothesis that the literature is "invented" from a stock of traditional elements leads to a kind of dispensationalism. (I suppose Foucault might have called these periods "epistemes.") The invention of a text serves to consume all the information that went into it, leaving us with a textual wall through which no image of the more distant past can penetrate. Time and again in this book, Akenson concludes some demonstration of the irretrievability of the history of Judaism and Christianity with the injunction to admire the "surpassing wonder" of the literary construct that blocks our view. There is something a little fishy about all this. Most of these little fishies live in the "Pool of Siloam," which is Akenson's term for Palestine in the period from the Maccabean revolt of 167 BC to the destruction of the Second Temple in AD 70. During the first half of this period, the "Judahist" commonwealth was more or less free of foreign political control. In the second half, the area was more and more ruled by Rome, either directly or through allied kings. The period was politically chaotic, to put it mildly, and, as is often the case in such situations, it was also culturally creative. This was the period in which there was a great efflorescence of religious literature, much though not all of it apocalyptic in nature. The Pool of Siloam swarmed with sects and philosophies that were more or less violent, pious, or merely bizarre. Some of their literature was recovered during this century in the Dead Sea Scrolls, and Akenson makes the interesting observation that, on the whole, this material rather confirms the significance of the apocryphal literature that we had already possessed, such as the "Books of Enoch." He also deplores the lazy habit of attributing all this material to the Essenes. Akenson compares the late Second Temple era to the "Cambrian Explosion," the period about 540 million years ago when, suddenly, a vast variety of multicellular organisms appeared. There were some earlier, but the fossil record suggests a real acceleration in the pace of evolution early in this era. At the end of the Cambrian, these creatures were almost all destroyed in one of the mass extinctions that punctuate Earth's history. Akenson similarly likens this catastrophe to the destruction of the Second Temple. The Romans, he says, effectively sterilized the Pool of Siloam, leaving only a few surviving sects to make their way in a wider world. In Stephen Jay Gould's account of the late Cambrian die-off, given in "It's a Wonderful Life," the few survivors of the catastrophe were selected wholly at random, thus ensuring that the nature of life on Earth after the disaster was quite different from life before it. Akenson tries to make a similar argument for Judaism and Christianity, but his heart clearly is not in it. This is just as well, since Gould's thesis has been pretty well refuted. Clearly, Pharisaism, which evolved into rabbinical Judaism, as well as Christianity, were pre-adapted to live in a world without a Temple. Neither was it an "accident" that some of the principle figures in these sects were not in Jerusalem when the Romans destroyed it. It was precisely because the religious practices of these groups were relatively independent of the Temple that they could set down roots in distant locales. One perhaps perverse effect of "Surpassing Wonder" may be to make some readers wonder whether AD 70 was very important at all. It really is not true that the post-Exilic religion of the People of God was a "temple religion" in the same sense as was the religion of the reign of Solomon. Solomon's Temple was where the people worked who composed the primary components of the documents that became Akenson's Genesis-Kings unity. The writings were auxiliary to the cult. The Second Temple, in contrast, was built to conform to the books that the exiles brought with them from Babylon. Akenson, apparently thinking himself a naughty fellow for making the suggestion, calls the Temple an "icon" for a religion that supposedly had none. In reality, it was more like a textual illustration. Akenson tells us in great detail about how the rabbinical survivors of Roman Palestine constructed a "temple of the mind" in the Mishnah and the commentaries on it, so that study about the Temple could substitute for worship in it. However, he also notes that imaginary Temples are features of the Dead Sea Scrolls literature, so the discontinuity of AD 70 was not total. Did the existence of Mecca prevent the composition of the Muslim Sharia? Now, the texts that Akenson (and most modern scholars) rely on to date all the Gospels after AD 70 are apparent predictions by Jesus in his apocalyptic discourses of the destruction of the Temple. The problem is that these references, particularly in Mark and Matthew, closely echo the description of the desecration of the Temple in the Book of Daniel. They are not different in kind from similar remarks in Paul's Second Letter to the Thessalonians, which is generally thought to have been written a good ten years before the Temple was destroyed. (II Thessalonians is not on Akenson's short list of epistles certain to have been written by Paul, though I gather that is an unusual position these days.) Thus, these "predictions" could easily be the sort of literary inventions that Akenson so loves, something that could have been written at any time after the middle of the second century BC. Akenson will have none of it, however. The problem is not theological. The problem is Akenson's apparent horror at the prospect that an ancient text might tell him something about history he did not already know. In some ways, Akenson's textualism works better with the rabbinical material, most of which does not purport to be historical. The Mishnah, the code of the "oral law" that was probably compiled by AD 200, was apparently designed to be memorized, and may not have been collected together in written form until the second millennium. Akenson is familiar with the mnemonic devices that the Celts used in the early centuries AD for their legends and legal codes, and it seems to him that the rabbis used much the same methods. Akenson describes the later chief works of the rabbinical literature, the Tosefta, the Sifra, and the Jerusalem and Babylonian Talmuds, as essentially attempts to tame the inflexible Mishnah. All but Sifra, which comments on the text of Leviticus, qualify and expand on the Mishnah and follow its structure. The Talmuds quote great slabs of it, along with commentaries and comments on the commentaries. Since the Babylonian Talmud, the last of these great works, was probably finished about AD 600, we have the odd spectacle of direct quotations from a book that was not entirely written down yet. Well, sentence structure in ancient Hebrew, as in modern Irish, goes verb + subject + object, so maybe it was indeed grammar that made a secondary question of establishing precisely the matter under discussion. Regardless of the criticisms I make here, "Surpassing Wonder" is a very amusing book. There is something to be said for any work that uses a biography of baseball manager Casey Stengel ("oracle and miracle worker") as a model for how a gospel might be written. There are 100 pages of chatty but informative footnotes. There are four major appendices, one of which, "Modern Scholarship and the Quest for the Historical Yeshua," would be a good candidate for expansion into a small book. Still, "Surpassing Wonder" should be consulted with caution. This is one book where it pays to check the citations.